Denise (the owner) of The Project Bin, must have some imagination!!! She not only came up with a stamp set featuring popular phrases by men (look for this inspiration in a few day), but she also produced a set made with phrases by a few Wise Women. How true is this sentiment????? 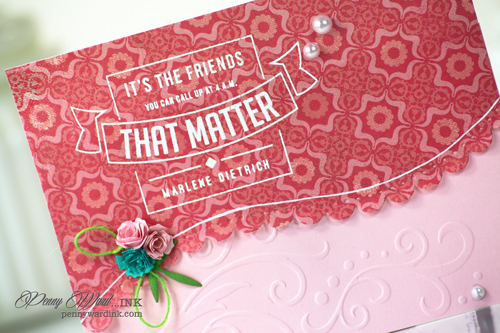 Using a fun pattern paper from Authentique and a Scroll folder for embossing makes this card super cute. 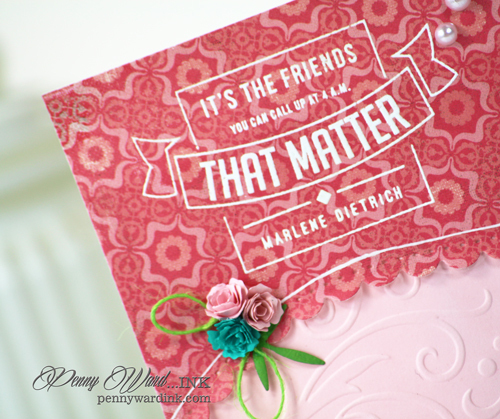 The swirled edge was die cut, then needing a little brightness, I added a line with a white gel pen. Tiny flowers were die cut, swirled and adhered to card front. I always love throwing in an odd color flower so the trio stands out. 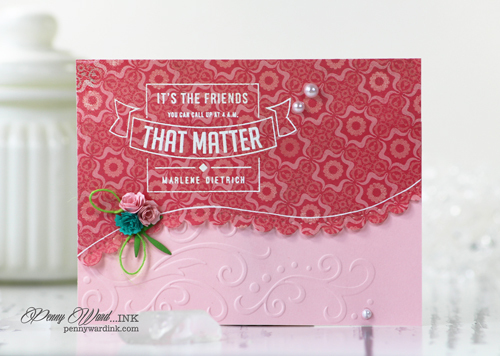 A few small faux pearls and this card is Easy Peasy Mr. Sneezy! Penny, for easy peasy it came beautiful. Just wanted to let you know I received my die in the mail safe and sound. Thanks for sharing and inspiring. Gorgeous card! Such a lovely design! So pretty!